A private boarding school that is supposed to hold close to 1000 students has collapsed during construction on Ado Akure road area of Akure city in Ondo state Nigeria. 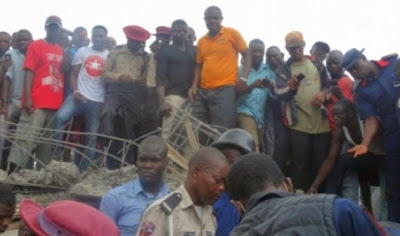 The collapsed building tragedy killed two workers and injured 2 others. According to eye witnesses, the building collapsed around 7am today when workers were just arriving at the construction site. Two workers were killed outright while the two injured men were rushed to a hospital. 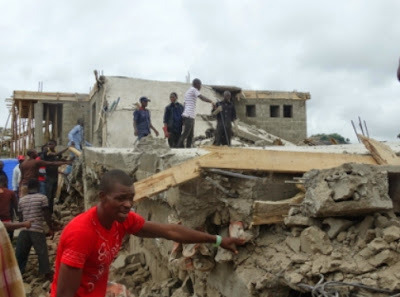 Olanrawanju Moses, a worker at the site said he heard a loud sound “gbam” and saw immediately saw rubble. Sounds from the collapse attracted crowds to the area. The incident happened along Ado-Akure road, two kilometers away from a populated motor park belonging to the National Union of Road Transport Workers (NURTW) in the state. Two of floors of the multi-story building were complete and work had begun on the third before it collapsed. The building was supposed to be a private boarding school intended to house thousands of students. People familiar with the area told our reporters the land where the building was being constructed is swampy, and its foundations were not properly sand filled before construction began. Observers said the catastrophe could have been bigger as it could have collapsed when it was completed and occupied by students. He added the state government will immediately order the construction engineers to stop work at the site until an investigation into the causes of the collapse takes place. The site engineer must be jailed for using substandard products. Builders should try and make their own blocks instead of buy improperly mixed ones.